The Drug Enforcement Administration (DEA) originally published a rule regarding industrial hemp products in the Federal Register on October 9, 2001, which was effective immediately, and announced it in a press release. Without any compelling reason or the required public notice and comment period, the DEA issued an interpretive rule banning hemp seed and oil food products that contain any amount of trace residual THC. In response, the Hemp Industries Association (HIA) and several other plaintiffs filed an “Urgent Motion for Stay” of the DEA interpretive rule, and on March 7, 2002, the 9th Circuit Court of Appeals issued a stay of the interpretive rule. The stay remained in effect and hemp foods continued to be sold at thousands of locations across the country while the case was litigated. Also on October 9, the DEA issued an interim rule exempting hemp body care and fiber products from DEA control and a proposed rule which would add language to the Controlled Substances Act making hemp food products illegal to sell or posess if they contained “any” THC. After extensive meetings and discussions with most of the major hemp food companies, it became clear that according to the official Health Canada testing protocol these hemp food companies’ products generally did not have any detectable THC and should therefore remain perfectly legal for resale and consumption. However, since the DEA had not specified a detection protocol and a corresponding de minimus limit of detection, companies had no way of knowing for sure if their products would be legal under the DEA’s new rules. Hemp seeds and oil have absolutely no psychoactive effect, and are about as likely to be abused as poppy seed bagels for their trace opiate content or fruit juices for their trace alcohol content (present through natural fermentation). Furthermore, the hemp industry established the science-based TestPledge program. TestPledge companies clean their seed and oil to assure consumers a wide margin of safety from falsely confirming positive in a workplace drug-test even when eating an unrealistic amount of hemp food daily. The DEA’s actions were especially puzzling, as they had not targeted poppy seed manufacturers for the trace opiates present in their products. In fact, the U.S. government raised drug-test thresholds for opiates in the 1990’s to accommodate the poppy seed industry. Vote Hemp board members David Bronner and Eric Steenstra hired a legal team and helped coordinate a challenge the DEA regulations. The lead counsel was Joe Sandler of Sandler, Reiff and Young and the co-counsel was Patrick Goggin, an independent California attorney with cannabis experience. Dr. Bronner’s provided the majority of the funding for the case. On March 21, 2003, the DEA published two new Final rules regarding industrial hemp products in the Federal Register, which were scheduled to go into effect on April 21, 2003. Despite overwhelming opposition, the DEA issued a final clarification rule banning hemp seed and oil food products that contain any amount of trace residual THC. The DEA also issued a final interim rule exempting hemp body care and fiber products from DEA control; however, this rule did not allow hemp seed and oil to be imported for processing and manufacturing in the U.S. thereby effectively destroying body care manufacturers’ ability to obtain the hemp oil they need to make their products. On February 6, 2004 the Ninth Circuit Court of Appeals issued a unanimous decision in favor of the HIA in which Judge Betty Fletcher wrote, “[T]hey (DEA) cannot regulate naturally-occurring THC not contained within or derived from marijuana-i.e. non-psychoactive hemp is not included in Schedule I. The DEA has no authority to regulate drugs that are not scheduled, and it has not followed procedures required to schedule a substance. The DEA’s definition of “THC” contravenes the unambiguously expressed intent of Congress in the Controlled Substances Act (CSA) and cannot be upheld”. On September 28, 2004 the HIA claimed victory after DEA declined to appeal to the Supreme Court of the United States the ruling from the Ninth Circuit Court of Appeals protecting the sale of hemp-containing foods. Industrial hemp remains legal for import and sale in the U.S. and sales of hemp foods and bodycare products have grown by double digits each year since the ruling. 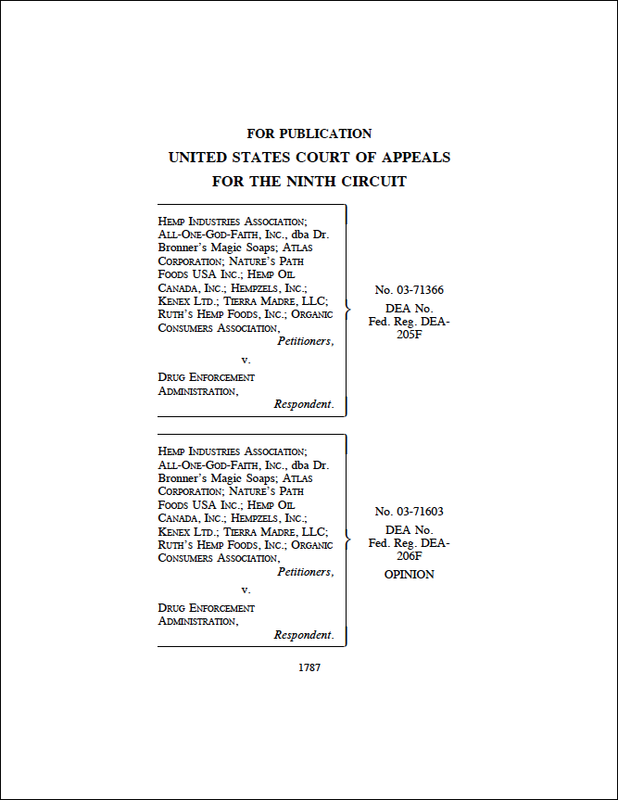 The summary “Agency Issues Legislative Rule in Violation of Administrative Procedures Act” by Harrison M. Pittman of the National Agricultural Law Center is an excellent overview of the Ninth Circuit Court of Appeals decision in HIA v. DEA. Hemp seed is one of nature’s most perfect sources for human nutrition. In addition to its excellent flavor profile, the seed supplies all the essential amino acids in an easily digestible form with a high protein efficiency ratio. Hemp oil offers high concentrations of the two essential fatty acids (EFAs) omega-3 and omega-6 in perfect balance. This superior nutritional profile makes shelled hemp seed and oil ideal for a wide range of functional food applications and as an effective fatty acid supplement. Not surprisingly, shelled hemp seed and oil are increasingly used in natural food products, such as corn chips, nutrition bars, hummus, non-dairy milks, pretzels, breads and cereals. The high and balanced essential fatty acid content of hemp oil also makes it ideal as a topical ingredient in both leave-on and rinse-off body care products. The EFAs help soothe and restore skin in lotions and creams and give excellent emolliency and smooth afterfeel to lotions, lip balms, conditioners, shampoos, soaps and shaving products. Hemp food and body care products have penetrated the mainstream marketplace. Estimated retail sales for hemp food and body care products in the U.S. exceeded $40 million in 2002, up from less than $1 million in the early 1990s. Sales increased even during the course of the lawsuit, despite the DEA’s scare tactics, and rapid growth is expected to continue. Poppy seeds contain trace opiates, fruit juice contains trace alcohol, hemp seeds contain trace THC. Trace contaminants exist in nature and in our food supply, and our government regulatory agencies set limits to protect consumer health. The hemp industry has responsibly addressed all health, safety and drug-testing issues with a wide margin of safety, and would like to formalize TestPledge standards with governmental sanction. However, the DEA does not want to acknowledge the truth about hemp seed and oil foods: they are a superior nutritional resource for humans. Hemp offers environmental advantages and has a long history of use for paper, textiles, cordage and birdseed, and is a nutritional food and superior body care ingredient as well. Hemp is now being grown in over 30 countries including Australia, Canada, China, England, France, Germany and Spain. Each of these countries has adopted regulatory models that allow for safe human consumption of hemp products. The U.S. is the only industrialized nation that does not recognize the utility of hemp and allow is growth. Legislation relating to hemp has been passed in numerous states to date. Even the National Conference of State Legislatures (NCSL) has adopted a resolution calling for changes to federal laws to allow for domestic hemp cultivation. The DEA’s new rules would have caused substantial harm to hemp businesses and consumers alike and were not based on any real threat or abuse potential. Like poppy seed, hemp seed is clearly exempted from the Controlled Substances Act by Congress. See 21 U.S.C. §802(16), (19) and (20). To read additional early history of the case please click here.